This is the long-awaited biography of one of Britain’s best and most successful racing drivers and it has been worth the wait. 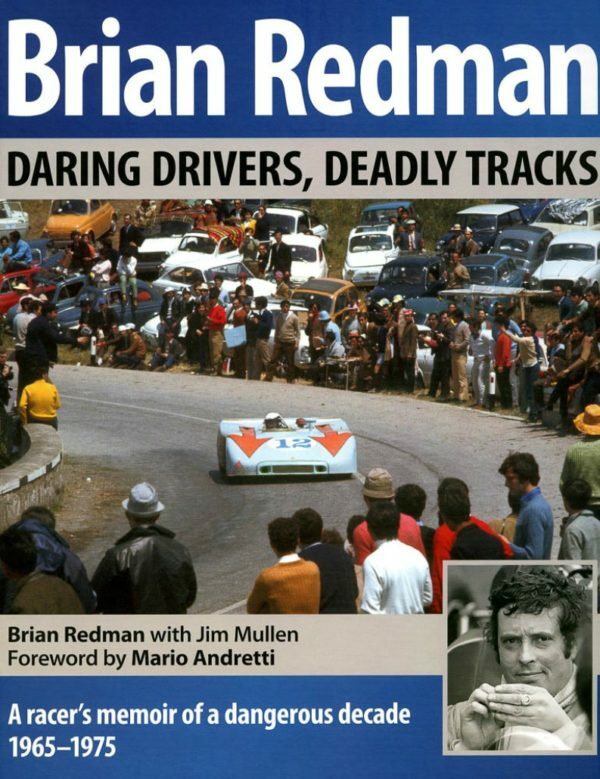 Don’t be put off by the mild sensationalism of the subtitle, Daring Drivers, Deadly Tracks; better to look at the back cover and read the quote from Mario Andretti’s foreword, “Brian writes like he drove, right to the point and always with passion”. Brian describes in an almost matter-of-fact way exactly what it was like to be a professional racing driver working for teams such as Porsche, Ferrari and John Wyer’s JW Automotive and racing legendary sports cars such as the Porsche 908 and 917, Ferrari 312PB and Ford GT40 at Spa and the Nürburgring – the old, full length versions – the Targa Florio and Le Mans. He numbered among his team-mates or competitors Jo Siffert, Pedro Rodriguez, Mario Andretti and Jacky Ickx so Brian’s story is one of racing at the very highest level. He was three times the North American Formula 5000 champion and, away from the big-engined cars, he revelled in driving 2-litre sports cars, particularly Chevrons. He ventured into Formula 1 where he had one of his three major accidents when the front suspension of his Cooper-Maserati failed at Spa (he was exonerated from ‘driver error’ only when Autosport’s photographer Peter Burn memorably caught the failure on film) and is the only driver ever to have received a second invitation to drive from Enzo Ferrari after turning down the first. Described on the cover as ‘a racer’s memoir of a dangerous decade 1965 -1975’ the book thankfully does not fall into the trap of so many biographies of becoming a merely chronological account from birth to retirement. Instead, it jumps right in with an opening chapter entitled ‘The original Spa-Francorchamps’ in which Brian vividly recalls the daunting 8.7 miles of public roads including the infamous Masta Straight – and even more infamous Kink – and no room for error. It was a circuit on which Brian won five races in ‘five fragile racing cars’. The chapter includes a 2-page detailed description of a lap of the circuit. Later chapters deal similarly with Le Mans, the Targa Florio, Daytona and the Nürburgring ‘Nordschleife’. By dodging about in time and concentrating in turn on different aspects of his career, life away from the tracks as well as the cars and the races, the story unfolds in an eloquent and fascinating way. In this, Brian has been assisted by Jim Mullen, another experienced and successful sports car driver who now heads his own communications company. It is also a very pictorial record of its subject’s story and the many photographs throughout the book are very well reproduced on the 300 or so glossy pages and at a size which allows them to make their own important contribution to the story. Altogether an excellent book and highly recommended for anyone with even a passing interest in a great period of sports car racing history and in search of a good read. Price: £50.00 (UK), $79.95 (USA), $90.00 (CDN). Hardback, 300 pages, 280x235mm (11×9¼in), copiously illustrated.